Grimm: “Once We Were Gods"
Maybe Grimm has a problem with establishing the scale of fright inflicted upon humans who see something they can’t explain. Drew Wu hears stories from his grandmother in the Philippines about an Aswang, then has a deep personal connection to a case where he encounters one of the creatures, can’t explain what he sees, and goes so far off the deep end he checks himself into a mental facility. But this week, an archaeology professor discovers that a mummified Anubis Wesen exists, hitting upon a professional discovery that could change her field forever, gets attacked by a living Wesen that goes woge in front of her—and Nick easily convinces her to chalk it up to stress at work. 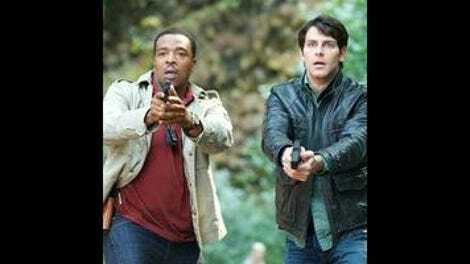 For Wu to take the blow so hard that he gets hospitalized one week, and the next a professor waves off a similar (if less extreme) scenario as stress from work after making a major discovery that could change her career, suggests that Grimm doesn’t always have the consequences of Wesen revealing themselves to humans lined up. That’s my one major quibble with this week’s episode, which was otherwise a finely entertaining twist on Egyptian material that incorporated Wu’s recovery and Adalind’s continuing journey to elude Viktor’s clutches with her creepily gifted half-royal child. I liked that Grimm used the Egyptian religious mythology in a way that revealed and examined Wesen moral standards—instead of simply raising a mummy like Buffy’s “Inca Mummy Girl.” Apparently there’s a Wesen secret organization, the Beati Paoli, a kind of medieval proto-Cosa Nostra from Sicily—which Monroe characterizes as a “vendetta society” aimed at vehemently protecting Wesen culture. They target museums, auction houses, and private collectors if they deem that certain curious artifacts aren’t properly respectful. Two such agents, canine Wesen that look like the Egyptian god Anubis, attempt to steal the newly discovered mummy in order to give it a proper burial. Of course, things go awry, a guard and one of the culprits ends up dead, and Nick and Hank get involved. I think I take for granted the number of topics that Grimm hasn’t yet used, from fairy tales to ancient mythology to religious iconography. But this was a fun hour of discovery. It’s also another encounter with the Wesen Council, which has so far afforded the show an opportunity to demonstrate how Nick attempts to police his jurisdiction as a Grimm. Considering most of the Adalind plot has unfolded with Renard awkwardly trying to handle things over the phone to his associates Meisner and Sebastian, Nick dealing with Alexander, an emissary assassin from the council, is a much better way to depict Nick’s progress toward interacting with the larger Wesen world. 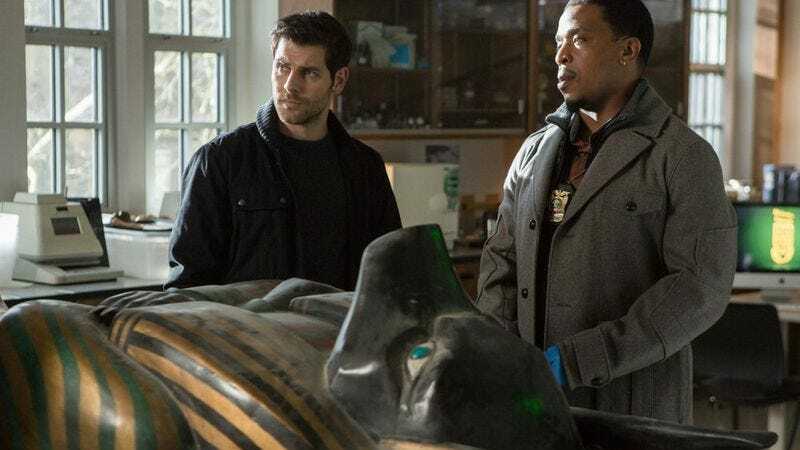 Alexander, the agent who appeared in “Stories We Tell Our Young,” is back to talk to Nick about how to handle the Beati Paoli and the Wesen mummy itself. Rosalee and Monroe have been in this position before, as uncomfortable middlemen between the powerful traditional will of the Wesen Council and Nick’s progressive Grimm actions. This week they lean toward the council, feeling charged up over humans displaying Wesen remains when the history from the Magic Airstream suggests that those Wesen ancestors were tortured or drugged into going woge and then mummified in a grotesque ceremony. They feel strongly that it shouldn’t be displayed, and that feeling of immoral insult is yet another complicated bit of ethical negotiation added to the list of Wesen cultural norms that Nick has learned. I do think it’s a weak point that the episode chooses Egyptian antiquity and then has Swiss agents of an allegedly Sicilian secret society taking on issues of respecting Wesen heritage. Addressing this issue with a specific Wesen from a specific country probably would have added some potency to the message of respectful treatment for ancient cultures. The issue of the professor agreeing with Nick’s explanation that what she saw is simply related to work stress muddles the climax, but the way Nick interacts with Alexander is a promising recurring development. Nick has staked out his territory, and he susses out Alexander’s end-around to steal the mummy while offering up the second suspect attempting to steal the mummy for Beati Paoli. The result satisfies everyone except the archaeologist: the police get their man, the Council retrieves the body, and the gang helps out with a proper burial ceremony that looks meaningful to Monrosalee, as they join Alexander in full woge next to the ceremonial pyre. As for Sgt. Wu, he grapples a bit with his visions and recurring nightmares (he doesn’t remember the first time his colleagues visited him at the end of last week’s episode), but after a checkup from Juliette, who shares her previous Wesen-related traumas without revealing anything too important, Wu at least appears resolved to put the incident behind him. That progression doesn’t make a lot sense, since Juliette’s memories should incite more questions from Wu as to how she dealt with it, and what she talked about with Nick, but instead it’s mostly swept under the rug. Perhaps in the future Wu will relapse, or maybe he’s just hiding how badly he’s still affected, but if this is the last the show deals with the issue of bringing Wu into the fold with the rest of the New Scoobies, that would be a shame. The opening epigraph is an adaptation of a few lines from the Egyptian Book Of The Dead. Not much to report on the Adalind front. Sebastian is in deep trouble with Viktor, and though he provides information on where Adalind and Meiser have gone, they’re still a few steps ahead thanks to Renard. The bigger development is who Adalind will turn to next for help—a major player from past episodes who will undoubtedly play a bigger role in the endgame for the season when she helps bring Adalind back onto Nick’s radar. “Is it me…or was that weird?” One-liner Monroe is my favorite Monroe.